Hi Guys! Manicddaily, a/k/a Karin Gustafson, filling in for Brian whose computer has crashed for today’s Meet the Bar! 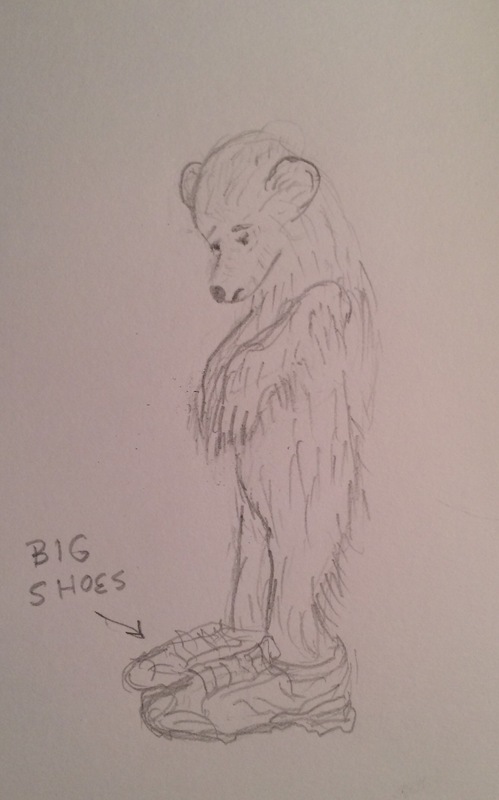 Bear with me as Brian’s shoes are very hard to fill! When my children were young, their dad set up a great birthday party game with colored strings. Each child at the party was given a separate colored string to follow and he or she would follow that string through a maze of angles and tangles, furniture and each other, till arriving at some little prize. Luckily, no one got garroted! Each kid just followed, followed, followed, sometimes laughing, sometimes frustrated, mostly fascinated. 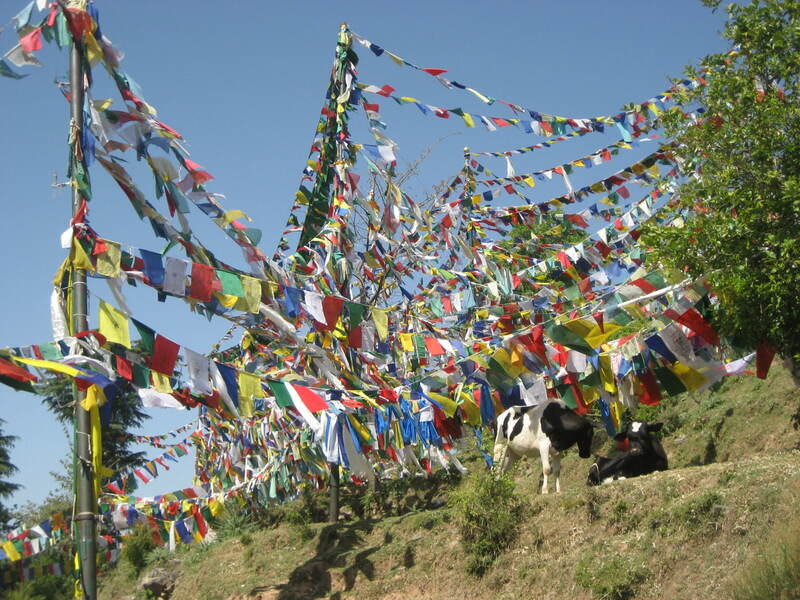 These are actually Tibetan Prayer Flags, not colored strings, and we didn’t have the cows! In sports, following through on one’s strokes (throws, kicks) is what makes for extra power. In many professions, following through is what gets a job done right. So, what does ‘following through’ mean when it comes to poetry? A lot of things. But for this Meet the Bar prompt, I am focusing on following through a metaphor–extending it through its visceral angles and tangles to help you get to the prize of your poem. 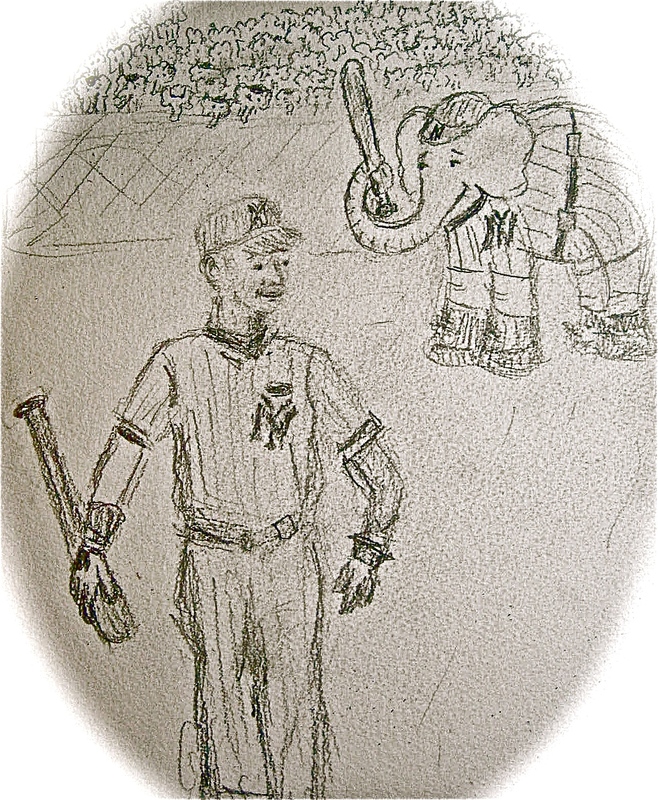 So, the exercise for the day is really dig into some metaphor or image–dig in and bat it out of the park! Ha! Gotcha! Because THAT, my friends, is the OPPOSITE of what I am urging you to try! Typically diggers do not use bats, and batters do not use shovels, and what I am encouraging today is to stick to one metaphor, and not to do too much quick mixing and matching. 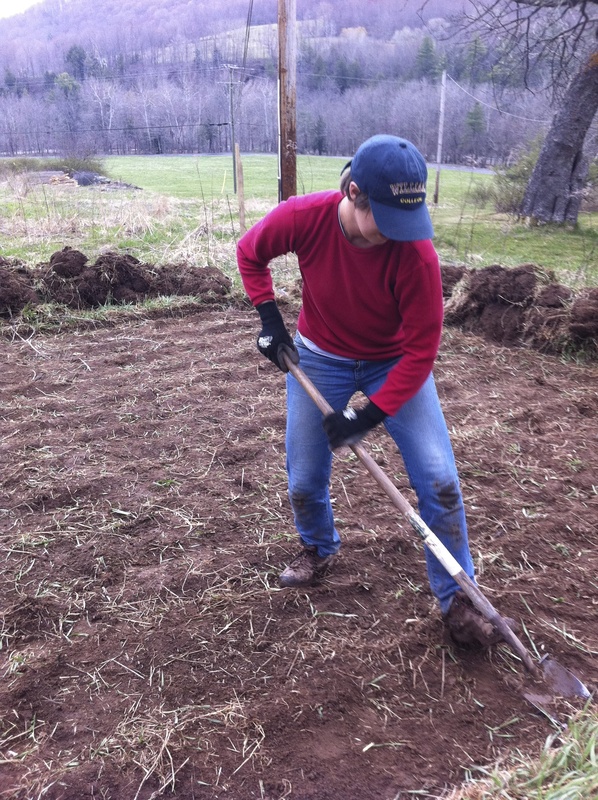 So that if, you are digging, your words are feeling the stickiness of the soil, echoing the clink of surrounding rocks. 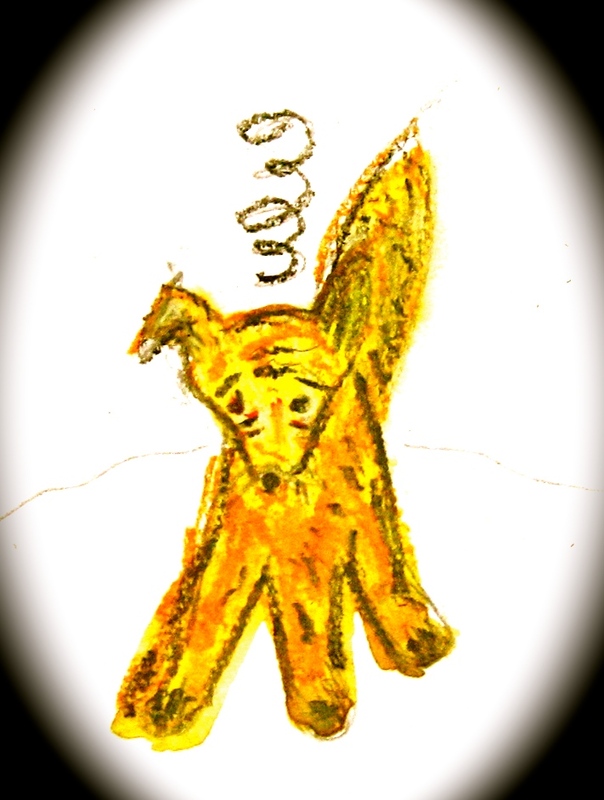 If you want some great examples of extended metaphor, look at Eliot–The Love Song of J.Alfred Prufrock where he writes about the yellow smoke/yellow fog as a cat; or Ted Hughes, The Thought Fox. But most of all, have fun with your metaphors–think of them as bridges across the divide of the beginning and end of your poem. And please do remember to extend yourselves (as well as your metaphors) to visit your fellow poets. 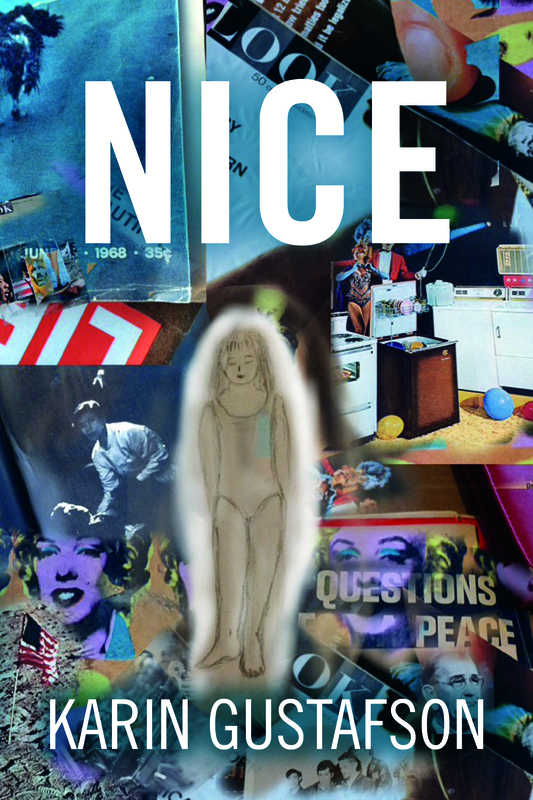 Finally–and I’m sorry to add the plug–I’ve just published a new novel, called Nice. 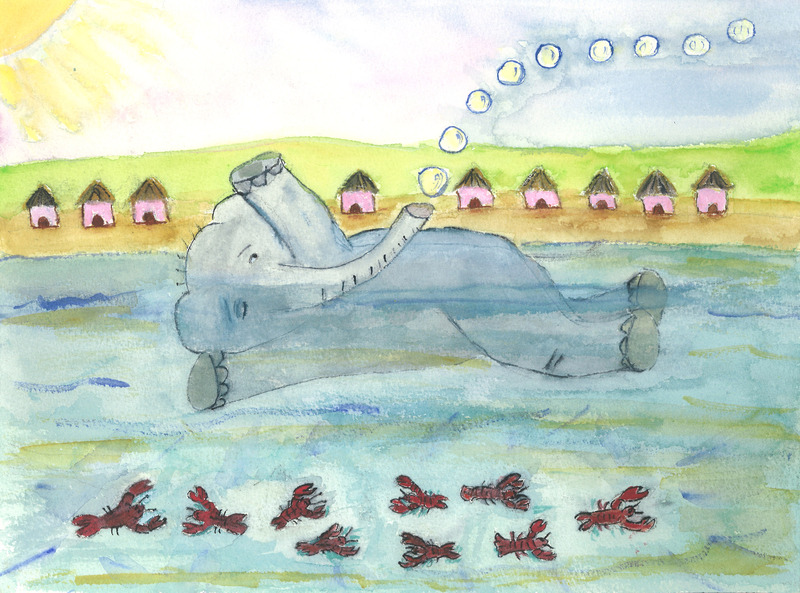 I’m sorry to say it is not rich in elephants but it does focus on one extended metaphor (having to do with a US sister and brother and the summer of 1968). Please do check it out! In the context of finishing this book, I wanted to send here my special thanks to Brian and Claudia who got me into this whole online poetry business. Although the poetry has been kind of a distraction from prose writing, it has given me confidence in the idea that someone might actually read what I write. I am tremendously grateful. So! Here’s the Drill For Those Who Want To Meet The Bar of Extended Metaphor! Follow Through! Hi Karin – Good to see you behind the bar. Felt I had to engage today and write something new. As usual when seeking for metaphors, I turned first to music. Thanks. Hi Claudia! how ya doin’? not bad at all… how are you doin? Great… have a few errands on the agenda today; it’s a bit cloudy tho–gonna have to pack an umbrella. nice… have fun – and hope you won’t need the umbrella…. Hey Anthony, nice to see you! k.
Wow, had not really known about “Extended Metaphors” as a poetic tool, although like many of us I have used them unwittingly. Quite the challenge to write a metaphor & then stay on task to extend it without polluting it, or adding more to it. I did have some fun with the challenge though; hope you dig it; keyed off of today as the 13th anniversary of 9/11. Thanks, Grace. Your poem was just fascinating. k.
Hey, just came out from a concert .. Beethoven and Shostakovich .. And I’m on the subway on my way home.. I enjoyed the prompt a lot.. Had a bad night trying to sleep, and that gave me my muse..
interesting combo… which music did you like more? Interesting question .. Both were good, and worked well as a unity. Theme of war you could say.. I am afraid my introduction went on and on – my apologies for that. it was very interesting hamish.. just cannot comment on your site for some reason.. I could not comment on your site either; no comment place it seems. Thought you data on the female Kurd warriors, bringing to mind the Israeli women soldiers, was very informative. Hi All! I am working and traveling for the next several hours–sequentially–I will try to comment from my phone when I am on the train but won’t be home for several hours. Thanks. k.
I will go to bed pretty quickly too..
Ooh…I am such a chicken at the meeting at the bar prompts…hence why i hardly meet up on this day! But I have been wanting to try… Will ponder and read those linked examples. Thanks for raising the bar! Ha! Or maybe not…will see if I can hurdle it. Good job shoe filling for Brian. A great topic to motivate some word digging and batting to happen, Karin. I am still arguing with my muse, but I hope to have something eventually. And condolences to Brian–nothing more aggravating than having your comp go down. It was a challenge to write and extended metaphor. Consequiently, mine may be too simplistic. But it was good practice. Good prompt Karin. Congratulations and good luck on your book. Hey Myrna, I really enjoyed yours. K.
I’m never quite sure of myself when “trying” to do metaphors…it’s always been a bit tricky for me. But I gave it try and thank you for being our hostess today. Hey Gayle–thanks for participating. Really enjoyed your poem. k.
Not sure that I’ve done this justice but I gave it a whirl. Congratulations on the novel, way to go. Coming in from work to see this, and thought I’d join you. I like metaphor, and have written whole poems using that form of writing device and style. Today though thought I’d share a recently written poem can be read literally, or as metaphor for a different kind of storm. Hope it works okay for the prompt. Well, I came up with a poem with an ‘extended metaphor’ tonight. I will be visiting those people who are generally reciprocal. Looking forward to seeing others’ metaphors! It was indeed a challenge to follow the metaphor throughout the whole poem. Yet challenges can be good incentives to stretch pour boundaries. Off to read what other people have written! ‘Our’ boundaries, of course. Autocorrect obviously thought otherwise. I wrote something on my train ride but will not be able to get it typed up tonight, I fear. Will make some rounds though! k.
first congratulations on your novel, and your drawings are great. I enjoyed this prompt a lot..thanks..have a great day.. Thank you so much! I have been doing a lot of recycling of drawings lately because so busy, but the bear is new! k.
This is an interesting prompt. Metaphor, the use of image of another….comparisons of one thing with another where generally they are poles apart but some connections can be found. Yes. I look forward to reading your poem. k.
Thank you so much. k.
Sorry to be so late in getting back to today’s posts! Working all day and just stopping now. Hope to make the rounds soon. K.
I think I’ve visited everyone now pretty much. Please let me know if I’ve missed someone. k.
Sorry, I posted the wrong URL. Here’s the correct one and I’ll post it there as well.